CMES, in co-sponsorship with the United States Holocaust Memorial Museum, is hosting a film screening of the film, 82 Names: Syria, Please Don't Forget Us. 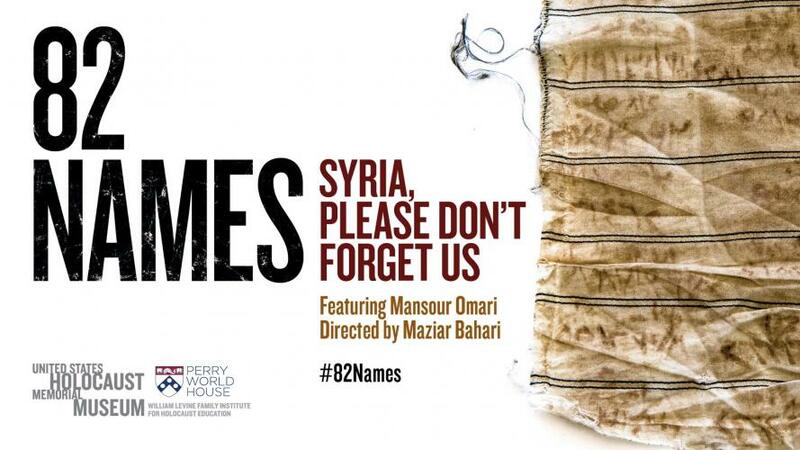 "82 Names: Syria, Please Don't Forget Us is a documentary film that traces the journey of Mansour Omari, a survivor of torture and imprisonment in Syria. When Mansour was released from prison, he smuggled out scraps of cloth swen within the shirt he was wearing. The names of his cellmates are written on them with an ink made from blood and rust. The film follows Mansour as he seeks to rebuild his life in exile. As the United States Holocaust Memorial Museum in Washington prepares to display the cloths, he visits sites in Germany that memorialize the victims of the Holocaust and he reflects on how to bring attention to the brutal regime he escaped--and how to counter extremist ideology in the future." Dr. Leila Hudson, Associate Professor of Modern Middle East Culture and Political Economy in the School of Middle Eastern and North African Studies at the University of Arizona, will be introducing the film and leading a discussion after the film screening.